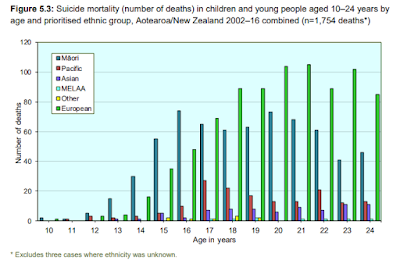 The following graph (P60) depicts the worst of statistics - suicide among young people. The ethnic/age information is new to me however and is exercising my brain. 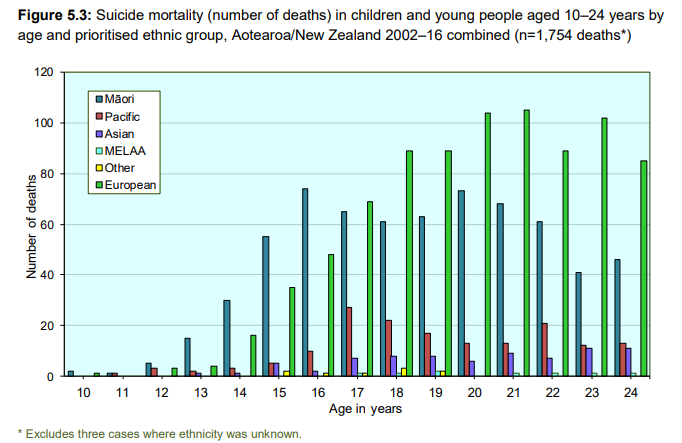 The peak for Maori suicide is much younger than for European. And the differences are inverse and large before and after age 16. I understand that some suicides are due to broken relationships. Does the variation reflect the tendency for Maori and Pacific youngsters to enter intimate relationships earlier? What else is behind these variances? (Bearing in mind they span 14 years so may mask differences between what was happening in 2002 compared to 2016).